PRODUCT DESCRIPTION: The Evans AFO is designed to treat or help prevent lower extremity disorders associated with immobility such as hip displasia, foot drop, contractures and pressure necrosis at the calcaneus. A comfortable Kodel lining provides a comfortable wicking interface for the patient. The anti-rotation bar is easily rotated and locked into a vertical configuration when not needed or during ambulation. Readily detachable non-skid walking pads are provided with each brace. 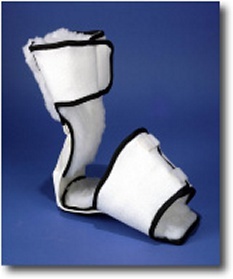 These pads can be applied for added safety during limited ambulation then removed when returning to bed. Neutral design allows the Evans AFO to be used for either left or right feet.